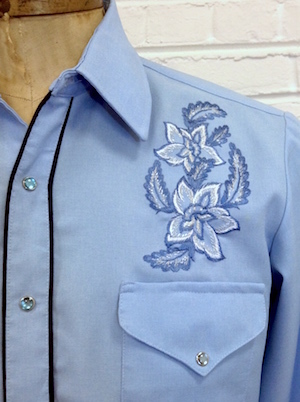 Home > Vintage Western Shirts > All Vintage Western Shirts > (L) Mens Vintage Westren Shirt! Light Blue w/ Embroidered Blue & Sparkly Silver Flowers! Vintage mens western shirt. Light blue with embroidered blue, white and sparkly silver roses on the front of the shirt. 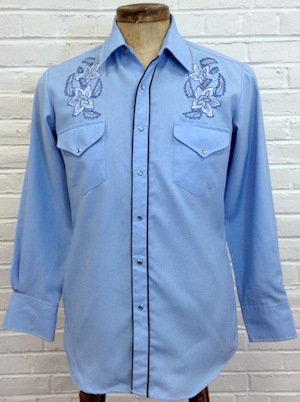 Pearly blue snaps down the front of the shirt with four matching snaps on each cuff. Two front pockets with flap and snap-closures on the chest. Placket of the shirt is outlined in navy blue piping. Shirt has a tapered hem. Tagged by Miller Western Wear. No material tag, but feels like a polyester/gaberdine blend. Chest: 44" Recommended for a Mens L. Shoulders on this shirt run a little smaller than the average L, so please check your measurements before ordering!